iTunes lets you control your music playback from its window, but if you don’t want the full interface visible while you listen to music, there are other ways to tell the app what to do. I’ll show you how you can control iTunes using built-in features as well as third-party apps, so that you can hide the iTunes window when you play your music. Let’s start by looking at what you can do with built-in OS X features. The easiest way to control iTunes is through media keys; these are some of the F-keys found on the top row of your keyboard. Press the F8 key to play or pause music. Press F7 to skip back—either to the beginning of the currently playing track, if you’ve played less than 10 seconds of it, or to the previous track. F9 skips ahead to the next track. To the right of those keys are volume buttons, but they affect system volume, not the iTunes app. F10 mutes your speakers, F11 decreases the volume, and F12 increases it. Note that if you send audio to an amp or other device via a Toslink cable or (in some cases) USB, these buttons have no effect on the volume. Speakers connected via USB can be controlled by these keys. however. 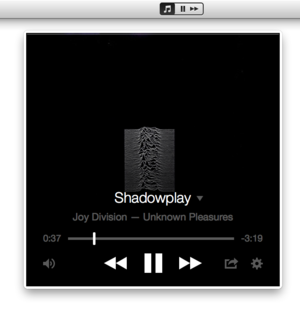 The iTunes MiniPlayer gives you quick access to most of iTunes’ playback controls. The MiniPlayer provides more than just play, pause, next, and previous buttons and a view of the album art. Using controls at the bottom of the window or within a menu that appears on the right side of the player, you can rate a track, add it to Up Next, start Genius, create an iTunes Radio station, and more. You can change the volume, search for tracks, view the Up Next queue, and control many other iTunes features. I find the MiniPlayer very practical, but since I use multiple desktops, this means you need to set things up in a very specific way to get it to work correctly. 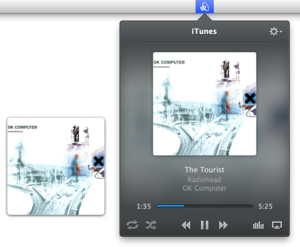 You can learn more about using the MiniPlayer in my In depth with iTunes 11’s MiniPlayer. If you don't mind working with a hardware remote, you can use it to control iTunes. If you have an Apple remote—the hardware kind, not the iOS app—you can use that to control iTunes on your Mac. You can start and stop playback with the Play/Pause button. The click ring surrounding the central Select button lets you move to the previous or next track (press the left or right side of the ring, respectively), and raise or lower the volume (top and bottom of the ring). Using the hardware control means having an extra hardware device to keep track of, but if you’re often a few feet away from your Mac, this is a good way to control it quickly. Note that the remote changes iTunes' volume, not the system volume. There are a number of third-party apps that let you control iTunes without its window being visible. Some offer keyboard controls, others visible controllers, and some have menu extras that you can click to access their features. Here are a few of them. Yellow Mug’s free (for basic version) Sizzling Keys gives you a full range of keyboard shortcuts to control iTunes, set ratings, change iTunes’ volume (not the system volume), and more. A $5 pro version lets you access other controls from the keyboard, such as skip forward or backward, and shuffle and repeat. You can optionally display a floating status window showing what’s playing or have that window appear when each new song begins. 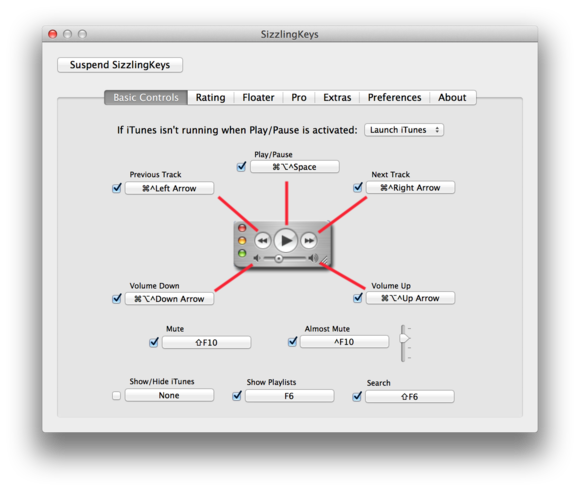 Sizzling keys is an unobtrusive app that runs in the background and lets you set keyboard shortcuts to control iTunes. The $2 Tunelet, by Aeolian Apps, is a menu bar controller. Click its menu—or press a keyboard shortcut—to access controls, view album art, and search your iTunes library. If you want to see what’s currently playing, Tunelet can display this in your menu bar. Tunelet would be better with more search results, and with more keyboard shortcuts to control playback. The developer told me he’s planning to add these features in the future. Equilibrium offers both menu bar and floating window controls. The $3 Equilibrium, by Logan Collins, goes a bit further than Tunelet. While it doesn’t display the name of the currently playing track in the menu bar, it does have a floating artwork controller. Access Equilibrium from the menu bar, and use its full range of controls. You can control playback, toggle shuffle and repeat, and even choose an AirPlay output. Equilibrium also offers keyboard shortcuts for play/pause, next, previous, and volume controls. Three themes are available for the floating window, and you can hover over that window to access play/pause and next and previous controls. The $3 Skip Tunes, from Gregory Dougherty, is similar to Tunelet and Equilibrium, but also offers control buttons in the menu bar (you can turn these off if you wish). You can click to play or pause your music, or to go to the next track. For more controls, click the music note button to display a floating controller with album art and additional controls. Skip Tunes gives you a wide range of controls, from the keyboard to a floating artwork controller. You can set keyboard shortcuts, and you can have Skip Tunes’ window detach from the menu bar and appear as a floating controller in two sizes. When displayed at thumbnail size the window shows a limited number of controls. However, a click enlarges it and lets you access all of its controls. Skip Tunes can also control Spotify and Rdio, and it provides notifications with album art, something iTunes doesn’t do. As you can see, there are plenty of options for controlling iTunes without having its window front and center. Take your pick: media keys, the MiniPlayer, keyboard shortcuts or full controllers. One of them is bound to do the trick.